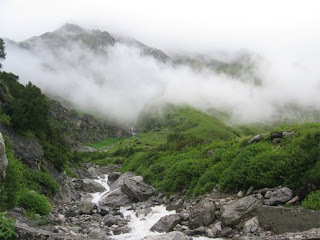 Valley of Flowers is situated high in the Himalayas in the Uttaranchal region, at an altitude of 3,600 meters above the sea-level, flanked by mighty mountains on both sides. During the colder months, the valley remains frozen. But with the advent of summer, the snow begins to melt and is replaced by a myriad range of colorful blooms. It is said that every 15 days a different set of flowers bloom. In 1982, the valley was declared a national park and is now a World Heritage Site. Our journey began from Hyderabad. We boarded the AP Express for Delhi on the morning of 9th Aug. The journey was uneventful and we landed at the NDLS on the morning of 10th Aug. We put up at the restroom at NDLS as our train to Haridwar was at 3 pm. It was around 9.00 pm when we reached Haridwar. Our hotel reservations were made so we just had to reach the hotel, grab a bite and hit the sack. The next day we got up early and after a hot cup of tea, packed our stuff into the Qualis that was to take us to Govindghat. It was the time of the Kavad Yatra. Saffron clad kavadias collect holy water from the Ganges (in Haridwar) and carry it back to their local temples to perform pooja. The roads were filled with numerous kavadias who come from different parts of the country carrying a brightly decorated kavad (a wooden stick with pots or cans at each end). We started early and by 7 am we had left the plains of Rishikesh behind. We had a long journey ahead and the advantage of starting early was soon obvious. We managed to not get caught in the Kavadia traffic and we soon hit the ghat roads. The distance between Rishikesh and Joshimath is around 260 kms and all along the serpentine roads wind around the mighty mountains. Each bend offered a breath taking view. At times the roads were so dangerous that a slight deviation from the path would have meant a plummet into the mighty Alaknanda flowing below. 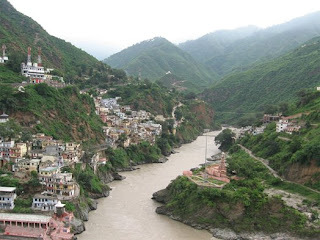 Our journey took us through Dev Prayag, Srinagar, Rudra Prayag, Karna Prayag and Chamoli. 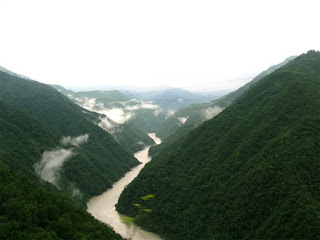 The prayags are basically a confluence of two or more rivers. It is a wonderful sight to see two rivers converging and becoming a single entity. We had lunch en route to Joshimath at one of the dhabhas. We reached Joshimath by tea-time and were put up at the GMVN guest house. Early next morning, after a quick breakfast, we drove to Govindghat. Govindghat looks like a mini Punjab. There are Sikh pilgrims all around. We hired a porter (Pitthu) to carry our luggage and start the 14 km trek to Ghangria along the Bhuyandar River. The initial few kilometers were difficult as the climb was steep. Occasionally the path leveled out. The landscape all along the path was rich – majestic mountains, numerous waterfalls and coniferous forests on the higher altitudes. The surging, roaring river was a reminder of the power and fury of nature. After climbing around 4 kms, I developed stomach cramps and was not able to walk further. We hired mules and with my husband accompanying me, we completed the remaining journey relatively quickly and easily. The rest of the gang braved it out and completed the uphill trek and reached Ghangria. Ghangria is a small village that serves as a base camp for all those interested in visiting the Valley of Flowers or The Hemkund Sahib. We had a sumptuous lunch at the GMVN guest house where we were put up for the night. The next morning after a quick breakfast, we started for the Valley of Flowers. We hired a pitthu. He was to carry me on the steep paths and otherwise he was there to carry our luggage. 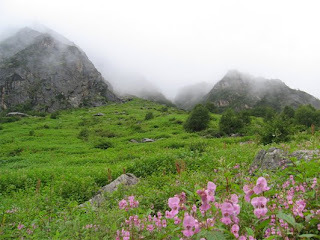 The Valley of Flowers is around 3 kms from Ghangria. We head out of Ghangria, cross a small bridge and reach a point where the path bifurcates into two. 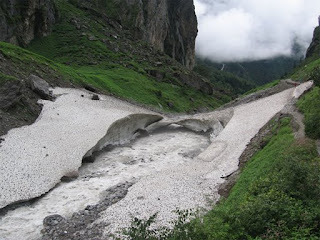 The right one leads to the holy Hemkund Sahib and we see loads of pilgrims going that way. The left one leads to our destination and is less crowded. No mules are allowed into the valley and as such the path is not littered with mule dung which was the case all along the way from Govindghat to Ghangria. We paid the entrance fees at the check post and entered the valley. The Valley of Flowers is a breathtakingly beautiful valley filled with delicate alpine flowers which complement the might rugged mountains on either side. Many streams, large and small, fed by the melting snow formed enchanting waterfalls at almost every bend. The misty clouds floating among the mountains added a lovely halo. The whole atmosphere looks so pristine. The petals and leaves were covered with dew drops and looked like jewels scattered over the mountains. The slender plants and flowers swayed in the gentle breeze. It felt as though the mountain was singing a lullaby for the vast array of plant life found in the valley. The sweet smell of numerous varieties of flowers filled the air. It was amazing to see an alpine glacier in the valley. The valley is undoubtedly a “Paradise on Earth”. The flower of the moment seemed to be the Himalayan Balsam as it was seen in abundance. It looked as though a pink blanket was spread on the mountains. The other flowers that we spotted included – the Cobra Lily, the Himalayan Cinquefoil, Campanula Latifolia (the Great Bell Flower), the Blue Poppy, the Himalayan Fleabane, the Himalayan Geranium (Geranium Wallichianum), the Himalayan Rose, Selinum Tenuifolium, the Himalayan Knotweed, Morning Glory, Cacti, the Jacquemont's Senecio, the Himalayan Whorlflower, Codonopsis Viridis, Heracleum Pinnatum, Anaphalis Triplinervis and the Rose Carpet Knotweed. There were many others that we spotted but could not identify. The mountains have their own ways. One moment the sky is clear and the next moment misty clouds appear out of nowhere and it starts drizzling. We wore the light-weight disposable raincoats that we purchased for Rs 20 at Ghangria. After spending some time in the valley we head back to Ghangria. The mountains were covered with misty clouds and it was beginning to rain. We reached the hotel in Ghangria and had a late lunch. The next day we began the downhill trek to Govindghat. It took around 5 hours to climb down and this time I did it too, with my husband encouraging me at every bend. You should have seen me walk for the next couple of days. It was a weird kind of walk – the after effects of the trek down. Trekking down puts pressure on one’s knees and calves. We then hit the road to Haridwar in the Qualis which was waiting for us. The journey back to Haridwar turned out to be the most adventurous one so far. There was a major landslide and we had to spend the night on the mountain roads. The next morning the bull-dozers arrived to clear the path. After being stranded for almost a day we started for Haridwar in the evening. All along the road to Haridwar we saw fallen rocks, uprooted trees and sludgy mud. We reached Haridwar late in the night and after a sumptuous dinner headed for Delhi. Now we are back home. Back to the crowded roads, the pollution and the noise. And my heart longs for the fresh air and the calm surroundings of the valley. We will surely go back there as the call of the mountains cannot be ignored. Check http://www.gmvnl.com/newgmvn/ for more details on accomodation and packages. I was glad to see article and nice photos of the Valley of Flower area. The region is beautiful. One should see Joshimath, Gangria, VOF, Badrinath also. I had been to this are few years back. The mighty rivers, great mountains, beautiful nature and nice friendly people have always welcomes nature lovers to this area. Instead of going to abroad and spending lot of money, one should see the variety of spots and nature in our oun country..which is more beautiful than man made beauty in foreign countries,,,!!! !